Sealaska Heritage Institute (SHI) will host a turf night this week in partnership with an education group in Juneau and give away free copies of its award-winning Baby Raven Reads book Salmon Boy: Shanyáak'utlaax to families with young children. Turf night is a bi-monthly event for families sponsored by the Association for the Education of Young Children, which promotes high-quality learning for all children, birth through age 8, by supporting all who care for, educate and work on behalf of young children. SHI is donating the books as a community service, said SHI President Rosita Worl. “Baby Raven Reads is an early literacy program for Alaska Native children, but the books produced through it are suitable for all children. By giving them away, we hope to promote cross-cultural understanding, which is one of the institute’s primary goals,” Worl said. SHI also is celebrating the book’s 2018 American Indian Youth Literature Best Picture Book Award, which will be given to the institute on Sunday, Jan. 27, in Seattle. 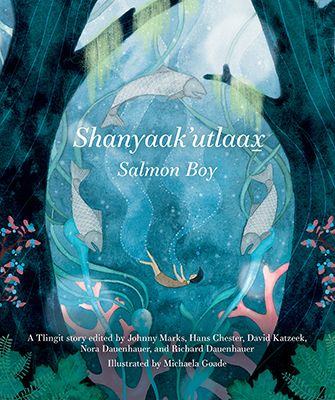 Salmon Boy: Shanyáak'utlaax was illustrated by Tlingit artist Michaela Goade. Shanyaak'utlaax: Salmon Boy is a children's story that teaches about respect for nature, animals and culture. It comes from an ancient Tlingit story that was edited by Johnny Marks, Hans Chester, David Katzeek and Nora and Richard Dauenhauer. Turf night is scheduled from 5-6:30 pm, Friday, at the Dimond Park Field House in Juneau. CONTACT: Kathy Dye, Media Specialist, 907.321.4636, kathy.dye@sealaska.com. Caption: SHI’s award-winning Baby Raven Reads book Salmon Boy: Shanyáak'utlaax will be given away to families at this week’s turf night.